How to know if the installation was correct? Difference between HD Mesh Scenery v3 and SimHeaven.com photoscenery! Why is region X not covered? Is the scenery compatible with Windows / Mac OS / Linux ? Can you modify the mesh for your own scenery projects? I recommend you to only use this for X-Plane 10. For X-Plane 11 there is now HD Mesh Scenery v4! DO NOT REDISTRIBUTE / MODIFY / OR CHANGE (for 3rd party purposes) any parts of “HD Mesh Scenery v3” without asking for permission in advance (usually I allow almost everything, but I like to know about it!). X-Plane 10 HD Scenery Mesh v3 is an update to the older v2 HD Mesh (and a replacement of the default Global Scenery) and brings a lot of improvements in many areas! It is a much higher resolution base mesh (more, smaller triangles) compared to the default Global Scenery which ships with X-Plane 10 (one could say: approximately 3-4-times more dense). This has been increased over v2! Water features (lakes / rivers) in Canada are now sourced from original government data instead of OSM (because OSM had some quite big gaps). (was in v2) Completely replaced the elevation data with viewfinderpanoramas.org (if you have a few cents, donate to that guy!). This doesn’t changes much in areas which were already great, but fixes some which were really hosed. Latest airport data (end of September 2014) boundaries used, to have up to date airport areas. Much smaller forest type changes are now correctly depicted, bringing more versatility to the forest landscapes. It turned out (thanks to a user report), that in Northern Europe, I did a misinterpretation of the underlying, raw landclass data, and thus introduced too many forests (where normally the land would be wet grassland –> “inland marshed” and “peat bogs”). Square (orthogonal boundary lines) forest areas inside large forest stands (where inside the big stand the forest type changes – often visible in Canada, or where you have large, extended forests). This was a very long standing, and annoying problem (or side-effect) of the scenery generator, which I could finally fix to a level, where the internal forests patches look much more natural now (the orthogonal/square pattern is now definitely mostly gone). Intermittent Water features (and OSM tag) removed (quite common in Canada). Roads all over the airports – this was a bug of the scenery generator. This is now fixed. In v3 there will still be OSM based roads inside airport boundaries, but they are eliminated from runways / tarmacs / taxiways. Mesh spikes (a few in Southern Louisiana, in NE Alaska around the Canadian border, and one in Massachusetts) – these are coming from the source elevation data. They have now been fixed in the source data as of April 2014. Some roads missing in the center of some cities (like for example in Rostock / Germany) – usually those were roads marked as “pedestrian only”. Some railroad lines appeared, which did not exist at all (for example at Miami Intl.) – turns out, my import script didn’t remove some historical railroad lines. This has been fixed. Highway 1 across the Florida Keys was missing – in this case it was a shared vector which also had historical railroad tags and was thus removed. This has been fixed. Some lakes and water featues were missing (like Silveretta Stausee) – these lakes had some less common “leisure” tags and were filtered out. For example “natural=water AND leisure=marina” have not been imported in v2. This has been fixed. You might have seen excessively high skyscrapers in very few locations (known places are Manhattan, Honolulu) in very rare cases (interestingly this issue does not show up on 99% of the installations … and even when it shows up, its not always reproducible over recurring sim starts … and yes, I could verify, that at least on the data side, they are indeed present in the DSF scenery data). This is a known bug in the scenery generator, which has already been fixed. Thus, these skyscrapres should be eliminated in v3. Deep “canyon” around Telluride (east of KTEX) … Obviously the river-in-mountain-smoothing-algorithm went haywire here. This river – and a few more – should be fixed in the next version, but I can’t make this 100% perfect, so there will always be a few, remaining “offenders” I am afraid. Many airports have trees on them, their terrain is not appropriately smoothed or they have no grass on it. Usually this comes from outdated apt.dat (the basic information about airport layouts in X-Plane) used at the time of the scenery creation. More than 850 airports (freshly from the X-Plane Gateway ) have received an update in v3. The scenery requires at least X-Plane 10.25 (beginning with 10.25 beta 1) which provides quite a few new terrain types/textures which this scenery relies on! Without it, your X-Plane will very likely crash on scenery load! Please only download a smaller ZIP file at the beginning! Then test if it works for you and only then continue downloading other tiles! Do not unnecessarily overload the hosting providers! If possible, use the BitTorrent option at flightsim.com! You might need very long time to download all tiles. Single file sizes go up to 3,6 GBytes! In the map you can see the size of each tile. 32bit X-Plane will often crash and is no recommended! Scenery shifts (when new, adjacent tiles need to be loaded) exhaust the usual 32bit memory address space most of the time. If you have less than 4 GBytes of RAM, don’t even try! With 64bit, I recommend at least 8 GBytes or RAM for a smooth (hopefully crash free) experience (and if you combine it with other scenery and want to be on the safe side, take at least 16 GBytes of RAM)! PLEASE READ AND FOLLOW THE INSTALLATION (AND THE SCENERY_PACKS.INI SECTION) INSTRUCTIONS CAREFULLY, as most of the problems result from an incorrect installation! If it still does not work on your machine, there is not much I can do for you (mostly because of the above limitations)! where the files are hosted (the files are identical across all sites, you only need to download one of them). You can (and should) choose one of those sites with the least traffic bottleneck (you might try, and see how fast your downlaod goes). flightsim.com supports torrents now out of the box! You can (and should if possible!) start using BitTorrent directly on the respective flightsim.com download pages (the links in the dynamic map will bring you there)! Look for the tiny, round, blue button with “qb” written on it: ! flightsim.com also offers you a first class membership (which at $30 for a year is less than many other, commercial add-ons might cost you), which removes all bandwidth limits for direct downloads at flightsim.com (other than the ultimate, physical limit posed by their server / ISP environment which is shared among all users). The flightsim.com BitTorrent support does not need a first class membership! The price in the shop is only there to cover the work / DVD media / deilvery (and NONE of that money comes to me! ), so it still remains freeware / donationware! Create a Subfolder called “Earth nav data” in your zzz_hd_global_scenery3 folder. Here, its very important to name it EXACTLY – without the quotes – “Earth nav data” and don’t make any typos (it is also case sensitive)! After you have uncompressed the ZIP file(s), put the resulting scenery folders (they should have names like +50-130,+30-120,+40+010 etc.) in the previously created (sub)folder “zzz_hd_global_scenery3/Earth nav data“! 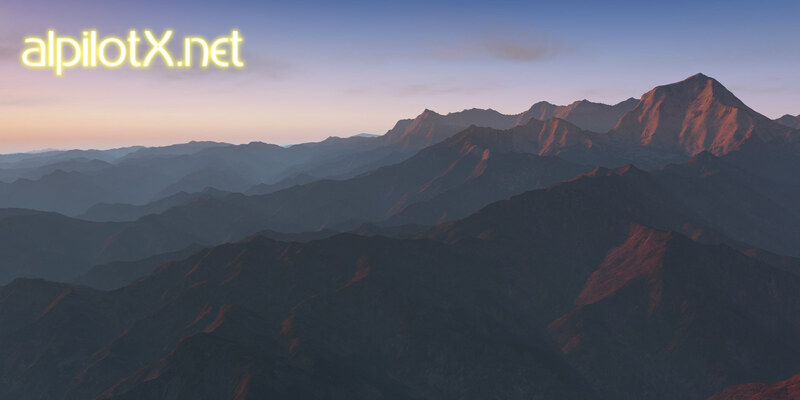 Now you can continue with the scenery_packs.ini section if this is your first HD Scenery Mesh v3 package! Otherwise (if you correctly edited the scenery_packs.ini previously) you can now start flying. This part is very important! If you do not do this, you will very likely NOT see any of your other add-ons (airports etc.) in a given region anymore! The reason is, that a “base mesh scenery” (which the HD Mesh Scenery v3 is) forms the base of your landscape and only layers above it will be rendered! Anything below the base mesh layer will not even be loaded. If you start X-Plane 10 the first time OR deleted(!) the scenery_packs.ini, it will create a new scenery_packs.ini and populate it exactly in the alphabetic order of your current folder names in “Custom Scenery” (in this case, the zzz_ prefix helps). If you already have a scenery_packs.ini (you have already run X-Plane 10 at least once), any new folder in “Custom Scenery” will be put automatically on the TOP (beginning) of scenery_packs.ini (which puts your new scenery folder at the highest level)! After some time, it turns out, that more often than I thought (or hoped), people have a broken installation and do not see/use HD Mesh Scenery (even if they think so). There is a very easy and straight forward way (other than obvious or less obvious visual cues) to check, if X-Plane is really loading the HD Mesh Scenery (and thus, your installation was correct). After a – hopefully – correct installation and correctly setting up scenery_packs.ini (see above) start X-Plane at a location where you have added HD Mesh Scenery coverage (of course, it makes no sense to check where you do not have it)! When X-Plane has loaded up your airport and you see the scenery, close X-Plane again cleanly (this makes sure, that really everything has been written to the Log.txt). Now open a file browser, go to the root directory where X-Plane is installed and open the file Log.txt (thats where X-Plane logs everything good or bad). Search for text like “zzz_hd_global_scenery3” (or the EXACT name you called the installation folder inside “Custom Scenery”). If you find multiple lines, which look like “DSF load time: 5869136 for file Custom Scenery/zzz_hd_global_scenery3/Earth nav data/+40-130/+48-123.dsf (635549 tris)” (of course, exact dsf file name, and numbers will vary depending on the place you loaded up) then everything is OK! X-Plane is indeed loading DSF (Scenery) files from you HD Mesh Scenery installtion. If you do NOT find any such line mentioning loading HD Mesh Scenery v3 DSFs (with “DSF load time …. for file Custom Scenery/zzz_hd_global_scenery3/Earth nav data/ …”), then something went wrong and you should carefully re-read the installation instructions! Strange plateaus around airports or water running up the hills. In most (if not all cases), this is not an error in the HD Mesh Scenery itself, but a result of disabling “runway follows terrain contours” in X-Plane Rendering Options. So, whenever you see something strange happening around airports, first try to enable “runway follows terrain contours” before you report an issue! A short explanation: if “runway follows terrain contours” is disabled, then X-Plane flattens the entire airport area to a given – constant – elevation (the elevation values is by the way encoded in the nav.dat – airport data … and can be edited / corrected with WED). Airports have trees on them, their terrain is not appropriately smoothed or they have no grass on it. Usually this comes from outdated apt.dat (the basic information about airport layouts in X-Plane) used at the time of the scenery creation. This can happen at any time when newer apt.dat is introduced (sometimes even by airport sceneries themselves). Lakes missing, which are tagged leisure=nature_reserve in Openstreetmap. This problem in the OSM import filter was only discovered shortly after the OSM data import/processing for HD Mesh Scenery v3 has been completed. This means, that all lakes (based on my researches, less than 100 are affected on the entire planet) which have the additional OSM tag leisure=nature_reserve, are NOT present in HD Mesh Scenery v3. This bug has been fixed internally, but will only take effect, whenever (which is completely unknown at this time) a re-cut will take place. A good example for this problem is the Lagunan di Ponente in Italy. SimHeave did take off-line all its photoscenery offerings, so this section is only here for those users, who did grab that scenery while it was available! So, I wanted to make clear some points here, because the one is NOT the other, and the other is not the one (while they still share a lot)! HD Mesh Scenery v3 shows you generic textures (the same set which comes with XP10.25) which are placed / spread out based on very detailed landclass data. HDv3-based dsf for photo sceneries shows you photo textures usually derived from google maps via the tool g2xpl! There is a second, less know difference because of the way how textures are applied. The tool g2xpl “slighty” re-cuts the irregular(!) triangle mesh structure of HD Mesh Scenery v3 into rectangular patches, so it can apply the rectangular photo texture tiles onto those small rectangular triangle patches. Because of this – the changed triangle mesh structure – “HDv3-based dsf for photo sceneries” can sometimes have a little bit different elevation representation (usually only seen in mountainous areas with a lot of fine grained changed in elevation data). After all, this also has another important implication! Because both sceneries have a base triangle mesh included (a base mesh), they can only be used in X-Plane 10 exclusively! They can’t be mixed (for very good technical reasons)! If you have more than one of them (and the default Global Scenery counts too) installed in the same place, then X-Plane 10 will only show you the one with the highest priority in the scenery_packs.ini! The other one(s) will just sit on your disk and take up place (but there are no other problems to be encountered)! So, in the end its quite easy. You have to decide if you rather would like to see photo textures or if you are much more happy with the (intricate, complex and usually good looking) generic texturing approach. Because everything else is – usually – similar in both sceneries! The real problem is not so much “my preference” for Europe or North America or Australia. The problem is much more, that I do not have equally good data for all parts of the world! The greatest problem is usually land cover data, which gives the fantastic detail to the landscape (or lets it look dull … if there is no good enough data). Europe and North America (and New Zealand, Japan and lately Australia) do have very good (or sufficiently good/usable sources which can be mixed well enough to get good results) land class data, which allows me to create the great scenery you have now … the HD Mesh Scenery. . Without data like that, it makes far less sense to create a HD Mesh scenery for a given region. BUT: rest assured, usually I am almost always scouting for new land class data! Whenever there will be good data for other regions, I will be there to check it out and generate scenery from it (if it is reasonable). The good thing in X-Plane is, that as long as a scenery only contains data (which is the case with this scenery) it is always completely OS independent (the scenery data is identical for all OS versions of X-Plane)! Only if a scenery uses plug-ins (which this scenery does not) can you have OS dependency. If you need to contact me, you either find me in most of the well known X-Plane related forums (my pseudonym is: alpilotx) or use the e-mail address on the contact page! Experimental, dense XP10 forest replacement! This is the same package as from the HD Mesh V1/V2 download (so, if you have downloaded it from there, you do not need to do it again)! At each update, X-Plane will ask you, if it shall overwrite the contents in the /1000 forests/ folder (restore it to the original, X-Plane “default)! You can always deny, or accept it (this way, you can get bet the default, even if you didn’t do a backup). And from time to time, you SHOULD go to the X-Plane default, as it will be improved too (over time), so you might miss out on improvements there! PLEASE DON’T REDISTRIBUTE this forest replacement pack! Its experimental, and should remain as such. Over time, I think we will tune X-Plane 10 default forests to a point, that you won’t even consider this pack anymore. Der große Vergleich: Mit welchen Landklassen und Texturen sieht Deutschland am besten aus?